Pheidole is a world-wide genus that probably includes over a thousand species. The genus is easily recognized by the presence of huge-headed major workers. These are often incorrectly characterised as ‘soldiers’, but they are in fact seldom involved in defence of the colony – they are much more likely to be the first to flee when danger threatens. Their huge heads and powerful jaws are apparently solely for use as ‘nutcrackers’, for cracking open seeds collected by the workers. It is not uncommon to find several heads of decapitated majors lying around outside the nest entrance, and it appears that in tough economic times the minor workers may get rid of the expensive, food-consuming majors. 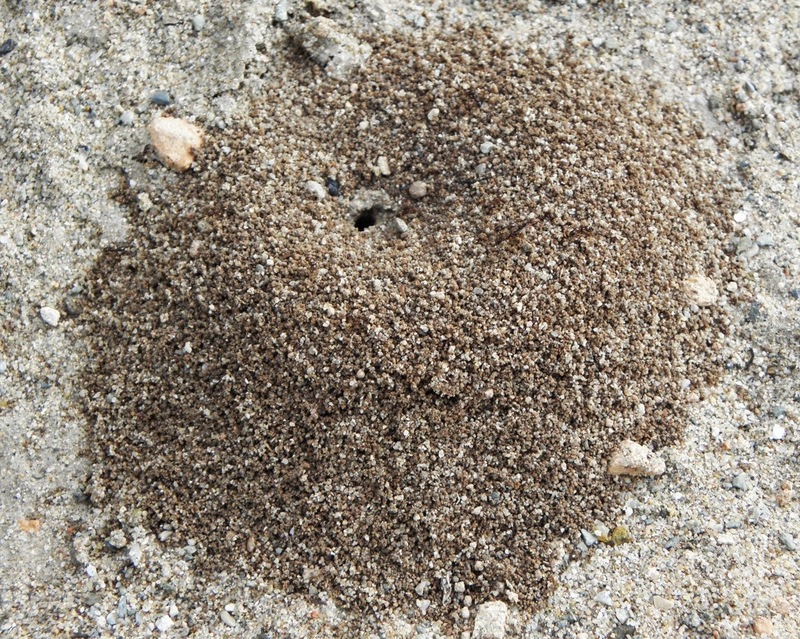 You should note that, like Messor, Pheidole collect seeds to consume them, a process not to be confused with myrmecochory, whereby some seeds are taken into the nest for the sweet, fruity outer layers they offer; the hard, inedible nutlets then remaining safely in the nest, protected from predators or from fire. The minor workers of some species can be easily confused with Argentine ants (Linepithema humile), but when in doubt look for [a] the huge-headed major workers, and [b] the narrow, double-jointed petiole (waist). 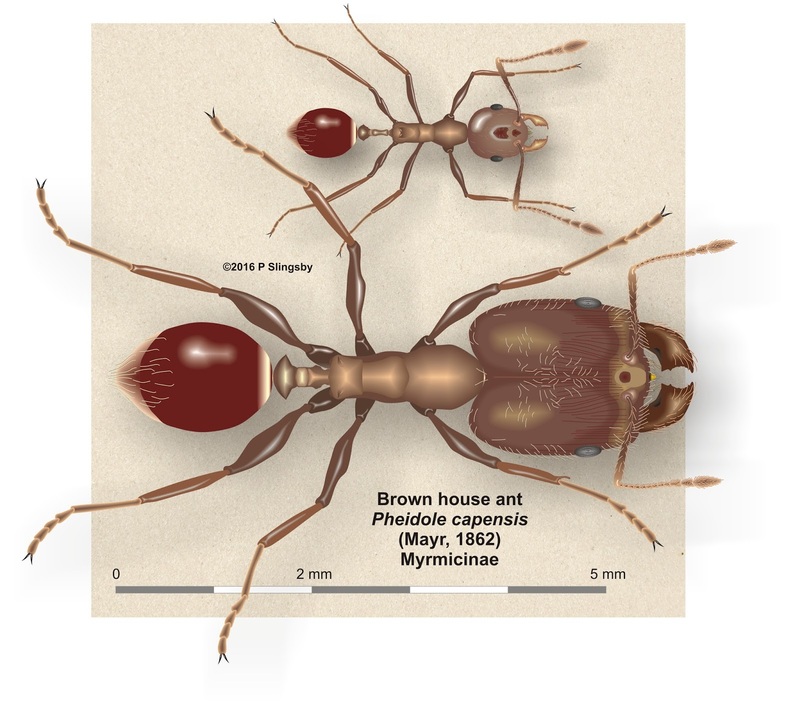 They can also be confused with fellow-Myrmicines such as Monomorium, Solenopsis, etc., but here magnification will reveal that Pheidole minors almost invariably have distinctive convex eyes set at the sides and on the midline of their heads. There are 26 species with 32 subspecies in Southern Africa, but the genus as a whole is in urgent need of revision and it is in practice extremely difficult to be certain about many of the species without microscopic examination. The name Pheidole comes from the Greek pheidolos, meaning thrifty – presumably because they gather seeds to store against hard times. Various common names are in use - big-headed ants, thrifty ants, nutcracker ants etc etc, but we have stuck to what seems to be the oldest of these – house ants. Majors: up to 9.5 mm. Dark red all over with legs and gaster an orange-red; legs and antennae clothed with erect pubescence; head with punctured sculpting. Post-petiole three times wider than long with blunt dentate spines on the sides. There is considerable variation in size and head proportions amongst the majors. Minors: 3.0 – 3.6 mm. Dark reddish brown with gaster almost black and shiny. Antennae long and slender with extended ‘club’; long propodeal spines. Body densely sculpted with puncture-like pits. Eastern Cape, KZN, Free State, Gauteng, Limpopo; Namibia, Swaziland, Zimbabwe. There are five subspecies. The Latin simply means ‘sculptured’, but the name could be misleading: these ants are by no means as sculptured as Cataulacus, Meranoplus, etc. Majors: 7.5 – 8.0 mm. Yellow-brown to brown. Head with weak striations [grooves]; dull matt. Post-petiole about twice as wide as long. Minors: 3.5 mm. Dull brownish yellow; post-petiole domed. Reputed to occur in Zimbabwe, but this may not be true; the ant is only listed by AntWeb for further north in Africa. The name means ‘like a mirror’, which makes little sense. Majors: 7.5 mm; pitch black with the front of the head and the base of the legs [coxae] dull to dark red. Head pitted and matt with fine striations [grooves]; petiole a simple elongate ellipse; post petiole about twice as wide as long. Minors: 4.0 – 4.4 mm; dark brown with appendages dark red; propodeal spines minute and triangular. KwaZulu-Natal, Mpumalanga, Gauteng, North West; Botswana, Mozambique, Namibia, Swaziland and Zimbabwe. There are three recognized subspecies. The specific name is Latin meaning ‘thick swelling’, and refers to the wide post-petiole. Minors: 3.7 – 4.0 mm. Colouring and pilosity as the majors. The eyes are large and convex and in the middle of the sides of the head. Propodeal spines very long and pointing nearly vertically. Legs long and shiny; rear two thirds of gaster also shiny, the rest dull. KwaZulu-Natal, Mpumalanga; Mozambique, Namibia, Zimbabwe. There are three recognized subspecies. Dr C. Liengme was an entomologist who collected insects, especially in Mozambique, in the late 19th and early 20th centuries. Majors: 5.2 mm. Medium red-brown with rear of head and upper alitrunk darker; front of head and mandibles red; appendages yellow-brown. All-over longish pubescence especially on gaster and appendages, with occasional erect hairs. Head concave behind the eyes and completely striate [grooved]. Propodeal spines short, sharp and upturned, sometimes almost absent; post-petiole has blunt lateral spines. Minors: 2.5 mm. Dark brown with slightly lighter gaster; mandibles and tarsi yellow brown, legs and antennae pale brown. Arnold and others argued that this should be a subspecies of P capensis. Recorded from the Western and Eastern Cape. Charles Gordon Hewitt (1885 – 1920) was a pioneer of conservation biology, and Dominion Entomologist in Canada for many years. Majors: 5.0 – 6.0 mm. Yellowish red with brownish gaster and scapes; head rectangular and squarish, and post-petiole wider than long, variably dentate on the sides. Minors: 2.0 – 2.2 mm. Colour as in the major but the sides of the squarish head are also more brownish. The size difference between majors and minors is the largest amongst local species in this genus. Botswana, Namibia, Zimbabwe. There are three recognized subspecies. Who Schultz was in 1910 I cannot determine; almost every Schultz known to Google seems to be or have been an entomologist. Majors: 5.0 – 5.8 mm; head dark red to black; alitrunk yellowish-red and gaster yellowish-brown. Head concave behind the eyes and completely striate [grooved]. Propodeal spines short, sharp and upturned, sometimes almost absent; post-petiole has blunt lateral spines. Minors: 2.5 mm; brownish yellow all over with reddish head. Propodeal spines often almost invisible. Subspecies capensis is recorded from the Western and Eastern Cape, Free State, and Lesotho. The other three recognized subspecies are variously spread around the Northern Cape, North West, KZN and Mozambique. The name simply means ‘of the Cape’. Majors: 5.0 – 5.6 mm. Yellowish brown; rounded head. Post-petiole wider than long and dentate at widest point. Minors: 2.0 – 2.4 mm. Yellowish brown with very sparse erect pilosity. Eyes set at midpoint of head; propodeal spines very small, just tiny points. Northern Cape; Lesotho, Mozambique, Zimbabwe. There are three subspecies. Majors: 5.0 mm; yellowish brown all over with yellow pilosity, dense on legs; head dull. Head concave behind the eyes and completely striate [grooved]. Propodeal spines moderately long, sharp and upturned; post-petiole has blunt lateral spines. Minors: 3.0 mm; head blackish brown, alitrunk red-brown, legs and antennae yellow-brown; abundant pilosity all over. Alitrunk and gaster shiny. Short, sharp, upward-pointing propodeal spines. Recorded from the Western Cape and KZN; the specific aspera means ‘rough’. Majors: 4.9 – 5.4 mm. Dark castaneous red to brownish, mandibles bright red. Post-petiole wider than long, with blunt lateral spines; head parallel-sided but slightly convex. Minors: 2.3 – 2.6 mm. Dark brown with yellowish-brown appendages. Oval heads, slightl;y narrower at rear. Zimbabwe. There are two recognized subspecies. Named for the Xoce River, where it was first collected. Majors: 4.7 mm; yellow-brown to red, legs paler, posterior gaster darker, dull-shiny. Head concave behind the eyes and completely striate [grooved]. Propodeal spines moderately long, sharp and upturned; post-petiole has blunt lateral spines. Minors: 2.3 – 2.8 mm. Reddish yellow, head brownish-yellow, gaster yellowish. Fairly shiny. Post-petiole globular in profile. Only recorded from Botswana. The specific name means ‘sand-‘ or ‘earth-lover’ and refers to its nesting habits. Majors: 4.6 – 4.9 mm; dark chestnut brown, with the posterior of the head, alitrunk and petiole redder; shiny all over with yellow pilosity. Head concave behind the eyes and completely striate [grooved]. Propodeal spines short, sharp and upturned; post-petiole has blunt lateral spines. Minors: 2.6 mm; dark chestnut brown, with the posterior of the head, alitrunk and petiole redder; scanty pilosity. Propodeal spines short and triangular. Only recorded from KZN. Dr Conrad Akerman (1878 to 1975) was the entomologist son of Sir John Akerman, speaker of the Natal Legislative Assembly from 1880 – 1882. Majors: 4.5 – 5.1 mm. Black with lighter appendages; occiput [‘forehead’] and body shiny with abundant long, fine hairs and distinctly bristly scapes. Head as wide as long and squarish. Post-petiole wider than long and with variable lateral spines. Minors: 2.8 – 3.0 mm. Dark brown to black with lighter appendages. Pilosity long but fairly scanty. Western and Eastern Cape, KwaZulu-Natal, Lesotho. There are two recognized subspecies. Auguste Forel (1848 – 1931) was a Swiss scientist of note, famous for his studies in neurology and psychology as well as myrmecology. Majors: 4.5 mm. Head and alitrunk dark yellowish red, spines and propodeum dark brown with a paler brown gaster. Post-petiole about 75% wider than petiole and as long as wide. Front three-quarters of head strongly striate [grooved]. Minors: 2.8 – 3.2 mm. Head and alitrunk dark brown to reddish brown, the rest yellowish brown; mostly smooth and shiny but with dull propodeum; pilosity long and abundant. Western and Northern Cape, KZN, Mpumalanga, Free State, Limpopo, Gauteng; Botswana, Namibia, Zimbabwe. There are four recognized sub-species. The Latin tenuinodis means ‘thin noded’. Majors: 4.5 mm; dull dark red to gaster almost black; gaster shiny; head has a distinct median line. Head concave behind the eyes and completely striate [grooved]. Propodeal spines moderately long, sharp and upturned; post-petiole has blunt lateral spines. Minors: 3 mm; head dull brown to black, alitrunk and antennae red-brown, gaster almost black. Legs long and tellowish-brown. Eyes very convex and set on the sides of the head, and back about four-fifths from the front of the head. Occurs throughout South Africa and Zimbabwe. There are two recognized subspecies. The specific simply means ‘of Africa’. Majors: 4.5 mm; dark brown all over with lighter antennae and legs; erect yellowish pilosity. The post-petiole is wider than long, trapezoid in shape, with variable spines. Minors: 1.8 – 2.3 mm. 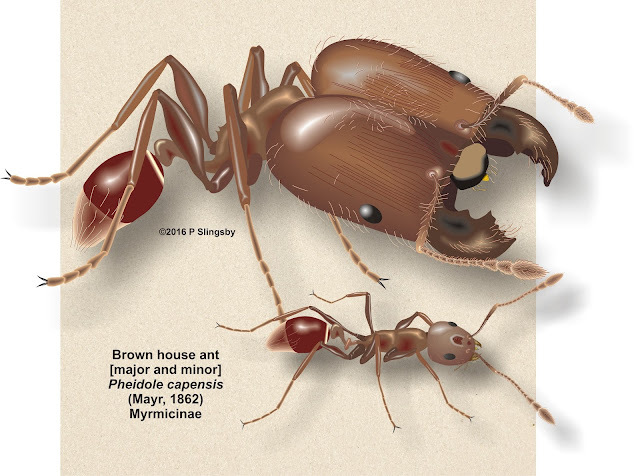 Overall dark brown, with lighter appendages and darker gaster and pale reddish-brown mandibles. Pilosity erect and yellowish, most abundant on the gaster. The eyes are fairly large and set at the widest part of the head. Post-petiole one third wider than long. Recorded from Gauteng and also Zimbabwe. There are five recognized subspecies. George Arnold (1881 to 1962) was in many respects the ‘father’ of Southern African myrmecology, famous for his 6-part Monograph on the ants of the region. He was myrmecologist at the National Museum of Southern Rhodesia for most of his working life. Majors: 4.2 – 4.5 mm. Dark reddish brown to light reddish brown, head always darker than alitrunk. Mandibles and back of head shiny; pilosity yellowish, semi-erect and sparse. Small propodeal spines directed backwards and upwards . Head as wide as long, with weakly convex sides, only partially striate [grooved]. Post-petiole wider than long with blunted lateral spines or teeth. Minors: 2.7 – 3.0 mm. Brown to yellowish brown; mostly smooth and shiny but with dull propodeum. Eastern Cape, KwaZulu-Natal, Mpumalanga, Limpopo, Gauteng; Botswana, Namibia, Zimbabwe. The Latin means ‘having small spots or punctures’. There are four recognized subspecies. Majors: 4.2 mm. Head and alitrunk dark yellowish red and dull, spines and propodeum dark brown with a paler brown gaster. Post-petiole about 25% wider than long; about twice as wide as petiole. Minors: 2.3 mm. Reddish yellow, head darker behind; gaster brown with paler beneath. Head rounded with very convex eyes at midpoint; propodeal spines quite small. Zimbabwe only. There are many Victors in the history of Myrmecology; I have no idea which one is honoured here. Only the minors of this species have ever been found. Minors: 2.7 mm. Brown or light brown overall. Post-petiole wider than long; head squarish. Eastern Cape and KwaZulu Natal. The Latin specific means ‘irritating’. Majors: 4.0 – 4.3 mm. Dark yellow-brown to red-brown, head and alitrunk dull, yellow pilosity with sparse to no pubescence. Head as wide as long and squarish; long, narrow propodeal spines; post-petiole wider than long and with variable lateral spines. Minors: 2.6 – 3.0 mm; coloring and pilosity as for majors; distinct pyramidal shaped post-petiole. Zimbabwe only. H. B. Maufe was a geologist who pioneered several surveys of the mineral-rich parts of Zimbabwe and Southern Africa. Majors: 3.7 – 4.2 mm. Rusty red with yellow-brown gaster; mandibles and scape rusty brown; lower legs and flagellum yellowish; yellow-rust overall pilosity. Head completely striate [grooved]; post-petiole has blunt lateral ‘bumps’. Head concave behind the eyes and completely striate [grooved]. Propodeal spines short, sharp and upturned; post-petiole has blunt lateral spines. Minors: 2.5 mm. Overall rusty yellow colour, with brownish head and antennae and vague brown bands on gaster. Overall rust-yellow pilosity. Head slightly elongated with convex eyes forward of the midpoint, and slightly shiny. Long propodeal spines and post-petiole as long as wide. Alitrunk matt but the rest shiny. Limpopo, Mozambique, Zimbabwe. Heinrich Prell (1888 to 1962) was a German entomologist; the subspecies name means ‘from Redbank’. Redbank, Zimbabwe is where the subspecies was first collected. Majors: 3.5 mm. Brownish yellow with dirty yellow appendages; sparse yellow pilosity, absent from tibiae and scapes. Post-petiole wider than long; head squarish with equal width and length. Minors: 2.5 mm; translucent brownish-yellow with dirty-yellow appendages, pilosity as for the majors. Two small ridges on upper alitrunk. KwaZulu-Natal. I have been unable to find out anything about Kitschner. Majors: 3.5 – 4.5 mm. Red brown with darker gaster and lighter appendages; head distinctly convex, as wide as long and rounder, not square, than many other species. Post-petiole wider than long with variable blunt spines on the sides; propodeal spines acute and sharp. Minors: 2.5 mm. Colouring as above, sometimes darker; gaster may have two distinct yellowish patches on either side of the post-petiole. Probably originating in Africa, this has become a ‘tramp’ species with probably the widest world-wide distribution of any ant. It is often extremely locally abundant and may eliminate other local ant species. There are three recognized subspecies. 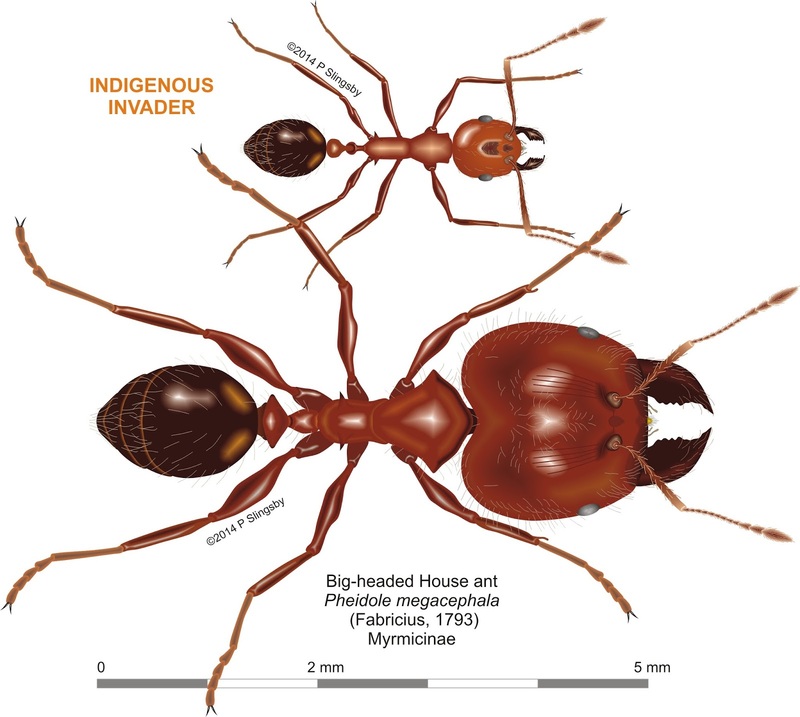 To date these ants have been recorded from the Western and Eastern Cape, KwaZulu-Natal, Mpumalanga, Gauteng, Botswana, Mozambique and Zimbabwe. The Latin name simply means ‘big headed’. Majors: 2.8 – 4.0 mm. Head reddish brown; gaster and alitrunk can be darker or much lighter; legs and scapes brown-yellow. Head striate [grooved]; distinctly longer than wide, parallel-sided. Post-petiole has distinct lateral broad spines. Head distinctly longer [1.5 x 1] than wide fully striate and parallel-sided; Head straight sided in full face view; mandibles very stout edentate border and without apical teeth; clypeus with median carina but anterior margin no more than medially concave; with relatively slender three-segmented club; postpetiole with distinct lateral prominences produced as broad to acute spines. Sparse erect pilosity. Minors: 1.8 – 2.0 mm. Dark chocolate brown with legs and scapes yellow brown; tarsi and flagellum ochreous; distinct erect yellow pilosity. Nest in wood or under tree bark. Mpumalanga, Mozambique. The species name is Latin and means ‘bridegroom’, while the subspecies means ‘swift’ or ‘flying swiftly’. Should we rename this the ‘Fleeing groom house ant’?